Seeking ways to entertain the kids on a jet plane or looking for the perfect solution on how not to pack everything but the kitchen sink when traveling with tots in tow? Has your can finally kicked the can trying to entertain the kids with old-fashioned games in the back yard? Summering in the city and hankering for new urban ways to play? Don’t sweat it ‘cuz we’ve got your covered! Here are our top picks to help make summertime livin’ easy for you and your family. Nomad Mobile Rental Gear Rental: Nomad is 100 per cent mobile, delivering summer and winter sports rentals right to your door for free. Book online. Free delivery within Calgary. No stress. No hassle. Mountain bikes, road bikes, hybrid bikes, stand-up paddleboards, kids’ bikes; bike racks, bike trailers, child backpack carriers, travel cases; skis, snowboards, cross-country, snowshoes, fat bikes. For more information, visit nomadgearrentals.com. Little Tikes Rocky Mountain River Race: A fun, inflatable water slide with two slides and a climbing wall. Hook it up to a garden hose and your kids are ready to enjoy hours of outdoor splashing fun! For more information, visit littletikes.com. Purchase at toysrus.ca. The Monster Factory VW Camper Pop-Up Play Tent: Let your kids travel back in time! Keep the little ones amused for hours in the back yard, Oceanside or while summering at the lake. Each tent comes in a groovy VW wheel carrycase. Purchase at chapters.indigo.ca. ZURU Bunch O Balloons with Launcher: Bring water balloon fights to the next level: the hose attachment with 37 pre-connected balloons that automatically tie themselves off once filled. Kids can prepare tons of water balloons in no time! Thanks to the launcher, you can throw water balloons farther than ever - up to 60 feet! There are several Mastermind store locations in Calgary or purchase at mastermindtoys.com. Trunki The Original Ride-On Suitcase: Kids can pack Trunki with their favorite belongings, and can ride or tow their travel companion. Parents can carry with the handles or shoulder strap, and even tow tired tots on long journeys. Great for vacations, weekend breaks and playing at home. For more information, visit oyaco.com. Purchase at Great Things in Store, Cochrane; Kacz’ Kids; Monkey Mountain Toys & Games, Okotoks; and West Coast Kids. phil&teds Lobster Portable High Chair: Why not have a lobster at the table every day? The world’s fastest deploying high chair! Unbelievably lightweight, perfect for travel, flat-packing and portable with quick-smart, clip-on clamping to most tables. Purchase at philandteds.com or there are two West Coast Kids locations in Calgary or purchase at westcoastkids.ca. Crayola Color Wonder Stow & Go Studio: Mess-free fun doesn’t have to stay at home. This neat travel tote gives you a portable writing surface and keeps all your materials ready for each magic coloring session. Separate storage areas for markers and activity book lets kids change marker colors without opening the entire tote! Purchase at toysrus.ca. Skip Hop Forma Pack and Go Backpack: Offers the convenience of hands-free parenting on the go! The spacious interior has room to tote everything from snacks to spare outfits, and the extra wide opening makes it easy to find essentials in a pinch. The front compartment includes two multi-purpose packing cubes and allows for extra storage. For more information, visit skiphop.com. 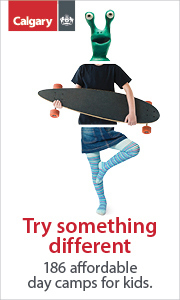 The City of Calgary Recreation Summer Youth Passport: Encourages youth, ages 7 to 17, to #GetMoving this summer (July 1 to August 31, 2016). The Passport provides unlimited swims, skates and gym time. They only cost $50; however, if you hold a July or August 2016 Youth Transit Pass, you can purchase it for only $25! For more information, visit calgary.ca/youthpassport. Purchase at City Leisure Centres, and Aquatic & Fitness Centres. Globber My Free 4-in-1 Scooter: This 4-in-1 is ideal to develop balance and help your child learn to ride and master the scooter with its low footboard, steering lock, height-adjustable handlebars and power-assisted steering. It can be fitted with a seat and transforms into a scooter/balance bike. Add the stick/handle and a parent can guide/push their child. For more information, visit globber.com. There are several Mastermind store locations in Calgary or purchase at mastermindtoys.com. Boosted Board Dual: Commuting is now recreation time! The Boosted Dual uses twin motor technology for superior handling and traction. With two powerful independent motors, you can carve hard and power through turns. Whether you’re out on neighborhood streets for fun or flying uphill past bikers on your way to work, Dual Drive is the perfect electric longboard. Comes with a Bluetooth Remote Control and 60-Minute Fast Charger. Riding in the streets with traffic is not to be taken lightly. Practice skills needed before riding on city streets. Purchase at boostedboards.com. Bell Helmets Segment Jr.: The secret to its comfort is the Bell FormFit, which makes the helmet fit more like a comfortable cap than a hard-shell helmet. The Segment Jr. meets both skate and BMX safety standards, making it the perfect everyday helmet for active mini-shredders! Purchase at bellhelmets.com. Ro Sham Bo Baby Junior Shades: These shades can be chewed on, dropped, thrown, stretched and stepped on! The soft, lightweight arms bend gently inward to help keep the shades on junior’s head while remaining ultra comfortable. The arms can be bent too to fit their head shape. And so light, they float! They block 100 per cent UVA/B rays. Purchase at roshambobaby.com. Zoku Fish Pop Molds: Dive into the world of Zoku Fish Pop Molds with your favorite under-the-sea creatures including mix-and-match tails for fun and surprising results. The sticks contain drip guards and have amusing ‘skeletons’ revealed as the pops are eaten. The pops are easy to remove from the molds by pulling on the sticks - no rinsing required. For more information, visit zokuhome.com. Purchase at chapters.indigo.ca. Candylicious Edible Bubbles: Blow ‘em, catch ‘em, eat ‘em! This amazing edible bubble solution contains no dyes, is non-toxic and doesn’t stain. There are several Mastermind store locations in Calgary or purchase at mastermindtoys.com. Finding Dory 4 in 1 Puzzle: Kids will enjoy putting together the pieces and you will enjoy the quiet when they’re assembling the four separate puzzles in this set of jigsaws inspired by Disney Pixar Finding Dory. Purchase at disneystore.com and check for availability at the Disney Store, CF Market Mall. ergoPouch® Summer Baby Sleeping Bag: The 0.3 tog baby sleeping bag is made from pure organic cotton for a comfortable sleep on warm summer days and nights; best for 24°C. Skin-friendly, eco- friendly, with no pesticides or chemicals. ErgoPouch’s baby swaddles, sleep sacks and sleep suits have received “hip-healthy” designation from The International Hip Dysplasia Institute. Purchase at ergopouch.com. PeapodMats: Bedwetting mats that are fun for kids and manageable for parents! A quality waterproof absorbent mat designed to protect the bed from all sorts of fluids. They lie flat on top of bed sheets with a grippy material underneath. This means the mat stays flat without bunching. Travel- and camp-friendly too! Purchase at peapodmats.com. Mabel’s Labels Day Camp Label Pack: This value-packed collection of UV Resistant, waterproof labels and tags has everything needed to avoid mix-ups and lost items at busy day camps. Make sure everything from clothes and footwear to backpacks, sports gear and more returns home! Dishwasher, microwave and laundry safe. Purchase at mabelslabels.com. MEC Original Bug Shirt for Kids and Youth: This shirt provides a great barrier between your child and those pesky insects, and cuts down the need for repellent. It is polyester with UV protection, loose fitting and has mesh sides for breathability. The zippered mesh hood works with or without a hat, has adjustable wrists and drawstring with cordlock waist. Purchase in- store at MEC or at mec.ca. Stuck On You Camp Postcards: Don’t let your kid rough it at summer camp this year; send them away in style! 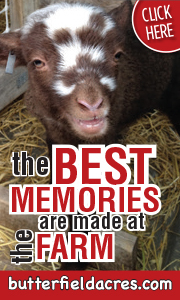 These personalized camp postcards are fantastic for kids going off to sleep-away camp. Handy Tip: Send these off to camp with a stamp already stuck on and addressed to Mom, Dad, Grandparents, etc. That way, all your child has to do is write and post! Purchase at stuckonyou.ca. Coleman Conquer 200L Headlamp: Come summer, we’re quick to strip off the winter layers, embrace the sunshine and head outside! Here is one of the hottest new items from Coleman, perfect for camp! This headlamp has no touch control and you can change the setting with a wave of your hand. Purchase at colemancanada.ca. 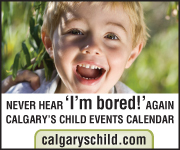 Melissa is the Copy Editor, and a feature writer for Calgary’s Child Magazine.